Old Alex shaded the women’s EY Hockey League playoffs as they won three from their four games before crucially drawing 2-2 to keep Muckross in second place at the Merrion Fleet Arena on Sunday evening. 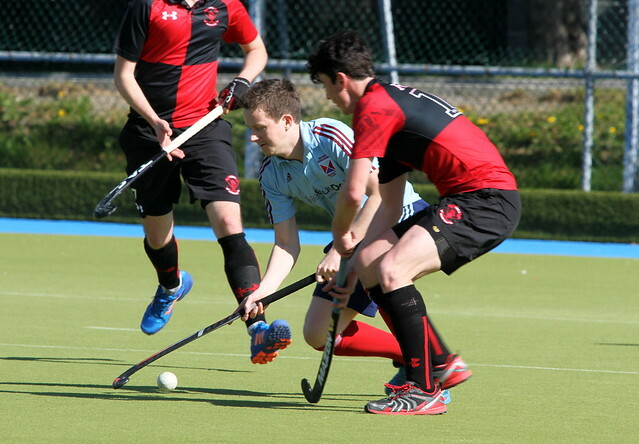 Alex topped the table overnight with wins over Cork C of I and Ballymoney on Saturday, putting them a point clear of Muckross who tied 2-2 with C of I before beating Queen’s with a late Clare Shillington cracker, 2-1. Both sides won early on Sunday with Lisa Mulcahy getting a last minute winner for Muckross to beat Ballymoney 1-0. That laid the gauntlet down for Alex who subsequently won out 2-1 against Queen’s. Sylvia O’Mahoney had the Milltown side 1-0 up before the Ulster club levelled from a corner. Chasing the game, Queen’s withdrew their goalkeeper for the final few minutes but Alex were the ones to profit with Fiona Bradish nicking in a deflection from a corner passed an unpadded defence for 2-1. It proved a key goal, putting them in pole position going into the decider with Muckross needing only a draw. The Donnybrook side did take the lead in the 17th minute with Yasmin Pratt on the mark. But Bradish’s reverse quickly tied things up at half-time before Katherine Egan slammed home a second goal in the second half to put Alex in great shape. Sophie Barnwell levelled the game once more at 2-2 with three minutes to go but Alex held on to that result to see out the tournament in first place with Muckross second. The Milltown side now go on to contest the five-team women’s EY promotion playoffs with Trinity, Greenfields, UCC and Lurgan.